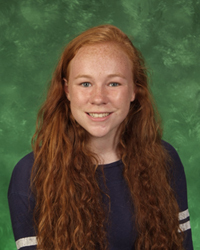 On January 21, Hathaway Brown senior Emily Spencer was named as a finalist in the Society for Science and the Public’s Intel Science Talent Search competition (Intel STS). The Intel STS is one of the nation’s most prestigious math and science competitions and rewards rigorous original research conducted by high school seniors. Every year, the Intel STS names 300 semifinalists and selects 40 finalists from the semifinalist pool. Emily Spencer and fellow senior Emily Amjad were both semifinalists this year. As a finalist, Spencer is already guaranteed a $7,500 prize and will enjoy an all-expenses-paid trip to Washington D.C. in March, including a visit to the White House and a meeting with President Obama. She will then present her research and compete for up to $150,000 in awards. Top award winners will be named at a gala event dinner on March 10. Spencer is the only finalist in Ohio and the only girl in the state to be recognized by both the Siemens Foundation Competition and Intel STS for her work. Emily's project "Synthesis of Photo-Healable and Thermal Shape-Memory Disulfide Polymers" was the culmination of her research at Case Western Reserve University's School of Engineering. Specifically, her project focuses on chemically formulating shape memory materials that can remember former shapes and return to them as a result of certain stimuli. Congratulations Emily, and good luck in the finals!